*1) Warning pattern repeats 11 times with an interval of 24 seconds. 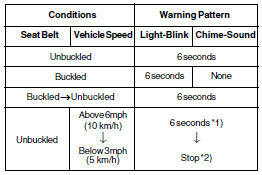 If the driver's seat belt is buckled, the light will stop within 6 seconds and chime will stop immediately. *2) The light will stop within 6 seconds and chime will stop immediately.